There are faster roads. There are more famous roads. But I don’t think there are outright cooler roads than this one, the Strada della Forra, so very close to fame. The most famous curvy roads of Europe, ones like the Stelvio Pass, are only a couple hours north of where this ‘Road of the Gorge’ sits. It winds above Lake Garda, in the mountains halfway between Milan and Venice. I only ever heard about the road from a chance Instagram post from an Italian mechanic I know. (Hi Santo!) I’d otherwise never heard of it, despite doing my best to know every alpine pass between the Pyrenees and the Urals. It took four years for Italy to carve the Strada della Forra out of the rock above a lake. It was ultimately completed in 1913, as Lake Garda’s website explains. It definitely looks like a road designed long before modern highway safety standards. There’s barely enough width for a single new car, though the short road is two-way. It’s too narrow to be a vicious driving road on anything bigger than a motorcycle, certainly, and the constant threat of rockslides make it a bit daunting, as DangerousRoads notes. Still, watch any clip of going through it and you’ll understand why so many make a pilgrimage there. The road itself nearly caught some fame when it kind of sort of almost was in the 22nd James Bond movie Quantum of Solace. 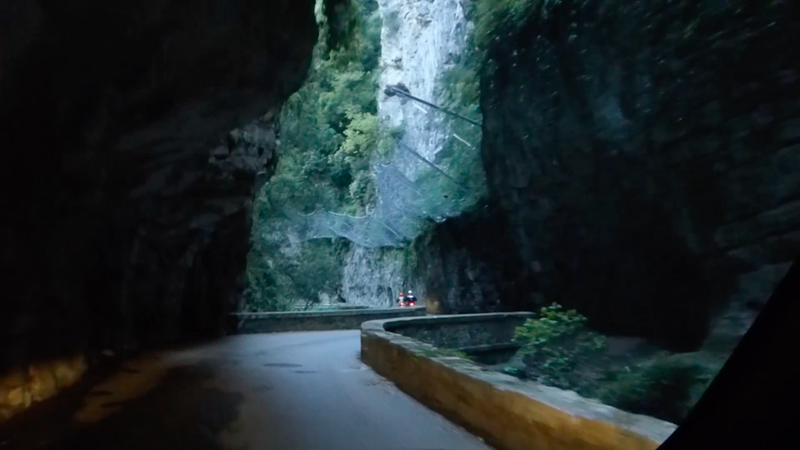 The opening chase scene mostly shows tunnels on the nearby state highway SS45, not the Strada della Forra’s SP38. The chase does briefly turn onto the road of the gorge itself, but then it cuts out into a quarry without showing any of the really good stuff. So this road just barely dodges a moment of great fame and remains one of the coolest, if not the coolest road ordinary people have never heard of. I must go to there.